Comments You can almost feel the energies overflowing in this Fully natural and untreated Blue Sapphire! It feels like the 6 claws of this statuesque sterling silver ring holding on to the energies! These kinds of gems are classified as ENTRY LEVEL! 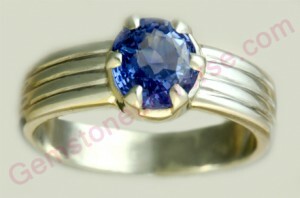 Blue Sapphires are the most powerful gems for the Karmic planet Saturn! And this talisman is sure to make a powerful statement!